Atlas and the Anchor: Tim Kasher - "The Game of Monogamy"
Tim Kasher of Cursive and the Good Life will release his first solo album, The Game of Monogamy, today on Saddle Creek Records. Lyrically, the album deals with love and marriage and all of the trappings of both with Kasher’s unique storytelling, while musically the album is straight forward with poppy and embellished arrangements featuring members of the Glacier National Symphony for his most ambitious and accessible project yet. The album opens with the “Monogamy Overture” a swelling orchestral intro to the album that crashes into “Grown Man” a pied-piper’s anthem for one of Tim’s recurring themes of refusing to grow up set to a marching snare and trumpets. The power-pop of “I’m Afraid I’m Gonna Die Here” features the best use of handclaps since the applause and upbeat horns for a standout moment. “Strays” is stripped down to just acoustic guitar, melodica, as an emotional love song for a love burning out. First single, “Cold Love” is another slice of power-pop about a love life lacking passion backed by a passionate arrangement featuring horns and strings and a wood block. The short “Surprise, Surprise” opens with twinkling toy piano and ends with a heavy rumbling riff that is cut off as it leads into “There Must Be Something I Lost” a reflective and searching ballad with a soaring combination of flute, oboe and violin that takes a surprising turn with an organ and piano led groove to end the song. Another super-catchy standout track is “Bad, Bad, Dreams”, a horn-laden clash with morality. “No Fireworks” may be another anthemic track about a passionless love but trying to avoid hitting the repeat button will take all you have. The album closes with “The Prodigal Husband” and “Monogamy”, two beautifully arranged numbers with Kasher’s trademark sad sack melodies coming full circle with a reprise of the overture that began the album. 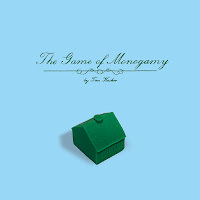 The Game of Monogamy proves that it doesn’t matter what name Tim Kasher records under, you are going to get a quality songwriting and storytelling unrivaled by his contemporaries. Azure Ray - "Drawing Down The Moon"